Our September Friday Showcase presenter is Elaine Raahauge. We had previously scheduled Kay Murray to present this month but she is unable to attend. We wish her well and look forward to Kay’s rescheduled presentation in early 2018. Elaine is a coordinator of our Friday Showcases and also volunteers her time in our QuiltNSW office. 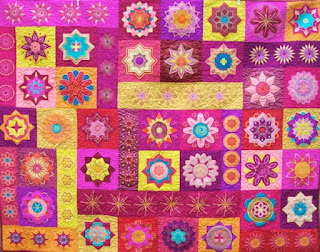 She began quilting over thirty years ago, when Amish quilts were instrumental in developing her love of and confidence in use of colour. 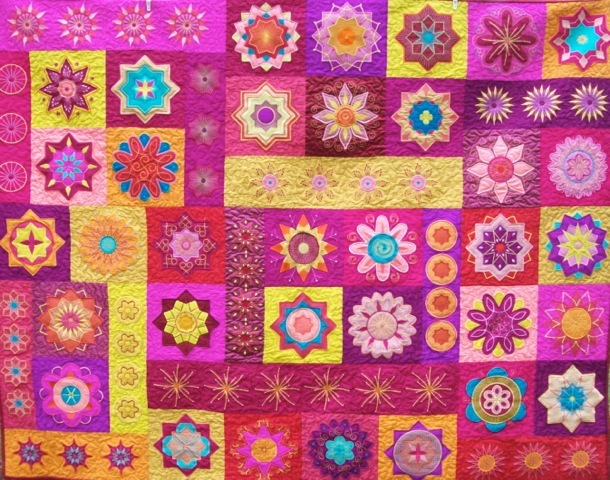 Incorporating machine embroidery in her quilts sent Elaine’s quilting journey in a new and exciting direction. Her first prize award for “Bollywood Flowers” in the Mixed Techniques category at the QuiltNSW Sydney Show of 2011 led to her designing and writing several articles for the Creative Expression magazine. She now mainly produces machine embroidered quilts and machine embroidered appliqué quilts. Elaine tirelessly seeks new and innovative ideas and techniques and her current interest in surface techniques encompasses painting her own fabric and enhancing with texture and sparkle. We welcome members and guests to see Elaine’s quilts and hear the stories behind them as she shares her quilting journey in our Showcase on Friday 1st September at 10am in our Pitt Street office (just behind Town Hall station at 276 Pitt Street, Sydney). QuiltNSW holds Friday Showcase on the first Friday of most months with the presentation starting at 10 am. Visitors are most welcome so bring a friend along - $5 for members and $10 for visitors. The full schedule of upcoming showcases is on our website.